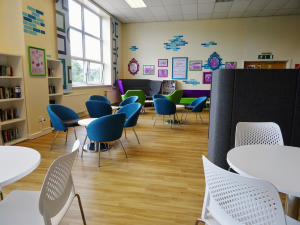 The Anglian Water Lincoln Breakout Space project was completed by TODDS in 2016. Anglian Water supplies drinking water to Parts of Bedfordshire, Buckinghamshire, Cambridgeshire, Essex, Lincolnshire, Norfolk, Northamptonshire, Nottinghamshire and Suffolk. Operating mainly in the East of England they cover over 2.6 million properties. 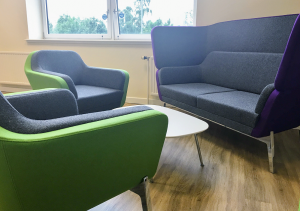 Anglian Water contacted us to create a solution for an empty landing area outside the First Floor Sales Office. 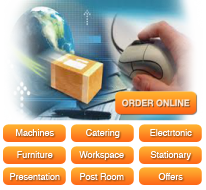 Along with a selection of other suppliers we had to come up with a unique design. 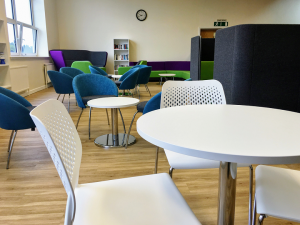 This area had to operate as a breakout space that employees could use during their breaks to relax, eat and meet meaning this had to be multi-functional. 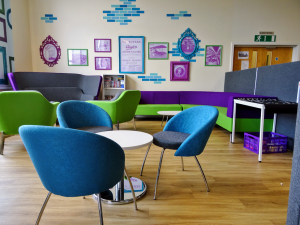 Julie Hayes (Project Support, OM Strategy & Change Team) lead the project and desired an area that was bold, bright and inviting. 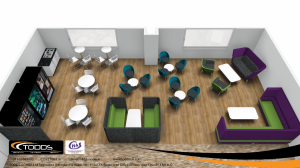 After completing a selection of designs, our proposal was put forward along with those from other companies for the employees to choose as an anonymous decision. 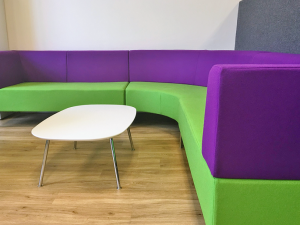 Using a combination of soft seating, Den units, high and low café seating and informal seating we came up with a solution that incorporated Anglian Waters house colours of Purple, Green and Blue. 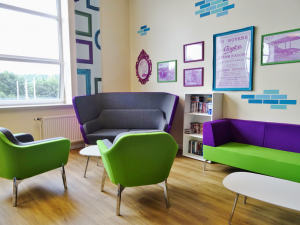 Products used were Ocee Designs Harc, Skyline, Venus, Den & Patch. After submitting our proposal, Julie informed us we had received the majority of votes. From here Julie was able to assess the budgets in order to see which fabrics would help enhance the area – settling for a combination of Camira’s Blazer, Halcyon Blossom and Craggan ranges due to their durability (Blazer Loughborough Silcotes & Newport, Craggan Cave & Halcyon Blossom Botanic). 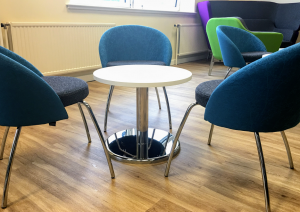 After being awarded the tender, Julie wanted to go one step further with the refurbishment and lay new flooring to replace the current tired carpet. 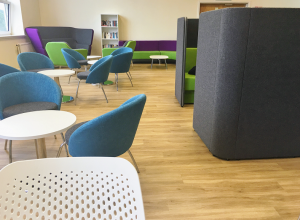 Overall the project took just under a day to install after fitting of flooring. 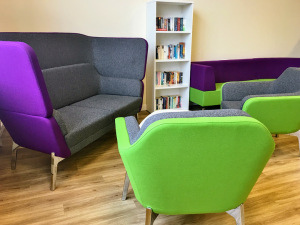 After fitting a few of their own finishing touches, Anglian Water employees are now able to enjoy a social space that allows them to switch off from their busy working environment.